The 2012 International Boxing Hall of Fame class was headlined by the induction of Tommy “Hit Man” Hearns. The Hit Man is a household name to both fight fans and general sport fans due to his success winning titles at five different divisions over the course of his career. Mark “Too Sharp” Johnson was also on the program that day and to many fight fans he was the “other” American fighter inducted that day. It was fitting for Johnson to be “other” fighter inducted that day, since throughout his career Mark was often seen as the “other” fighter in his own division and in the larger fight world. However, when we take a look back at the career of Mark Johnson we find a trailblazing fighter who dominated a division like no American had ever dominated before. Unfortunately, due to politics of the game, fight fans missed out seeing how great Johnson really was. Born in Washington D.C on August 13, 1971, Mark was the son of a boxing trainer. Being born into a fight family, it didn’t take long for Johnson to join the family trade. Mark entered the ring for the first time at five years, and quickly became a dominant amateur. Mark was given the Nickname “Too Sharp” by his best friend, and his amateur career was capped off with a U.S. Amateur championship in 1989. The American fight game historically has been dominated by fighters in the 140lb and higher weight classes. Mark turned pro in 1990 and despite the historical trend; “Too Sharp” took the Flyweight division by storm, winning 38 straight fights at the flyweight division. While most fighters with Mark’s type of talent prefer to take safe and easy fights in their hometown, Mark took a different route. Mark had a desire to face the best in the game on the biggest stages. This competitive fire took Mark away from D.C. and he became a regular fighter on the West Coast at the Great Western Forum when the Forum was the biggest stage in boxing. Despite fighting many big fights outside of D.C., “Too Sharp” never wanting to be away from his family, never held a training camp. Instead he trained in his own gym in D.C. and that training formula turned wildly successful. 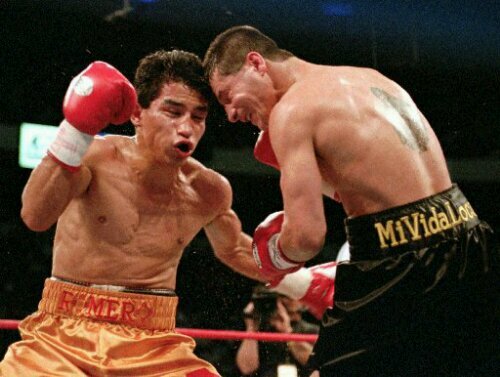 On May 4, 1996 Mark defeated Fransisco Tejedor via an impressive 1st round KO to become the IBF Flyweight Champion. No African American had ever held a Flyweight Championship before Johnson accomplished this historic feat. Mark successfully defended the IBF Flyweight Title seven times before moving up to the Super Flyweight division. In his first fight at Super Flyweight, Johnson defeated Ratanachai Sor Vorapin via a 12 round unanimous decision on April 24, 1999 to win the IBF Super Flyweight title. Johnson defended this title three times before moving to Bantamweight. 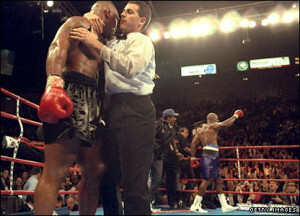 Mark’s 3rd and final Super Flyweight defense was declared a no contest when an all-out brawl broke out due to low blows. The fight was called in the 4th round and Mark was ahead three rounds to none on all three judge’s score cards. Johnson moved up to Bantamweight and after two easy wins, stepped into the ring to face Rafael Marquez on October 6, 2001. Mark lost via split decision in what is considered one of the worst refereed fights of all time. Referee Robert Gonzalez took 2 points away from Johnson for holding and that proved to be the difference in the fight. Mark then lost the rematch with Marquez four months later via knockout. Many fight observers thought that after the 2 fights with Marquez that Johnson was finished as a top level fighter. However, Mark had different plans and dropped back to the Super Flyweight weight class and on August 16, 2003 Mark defeated Fernando Montiel via a 12 round majority decision to become the WBO Super Flyweight champion. Mark successfully defended the title twice before he lost it to Ivan Hernandez on September 25, 2004. Johnson fought one last time in February 2006, suffering a final defeat at the hands of Jhonny Gonzalez. Throughout his career fight fans were consistently entertained by Mark’s charismatic personality and exciting performances. Johnson never had a consistent style, instead he had an incredible ability to adapt to his opponent’s style. Fighting in an age where tape study was a key part of most fighter’s training camps, Mark never watched a minute of tape during his career. He simply had natural instincts that allowed him to scientifically box when needed or simply start a slugfest with his opponent if that was in his best interest. This natural boxing ability made Mark one of the most dangerous potential opponents for his contemporaries. 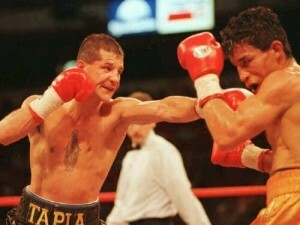 Throughout his career, Mark called out the best in the game including Johnny Tapia, Danny Romero, and Michael Carbajal. Top Rank promotions owned the promotional rights to many of the top fighters in Johnson’s weight class and they kept their fighters away from Mark. Due to the top name fighters ducking Johnson, Mark was never able to secure the marquee fights he deserved or fight fans wanted to see. This cost Johnson millions in personal income as well as left a void when his career ended; disappointed that he never got to show the world how much better than the other “names” he really was. Boxing has always been in Johnson’s blood and when he retired he continued to be part of the game. He began training young fighters, sharing his love of the game and keeping the kids off of the streets at the same time. 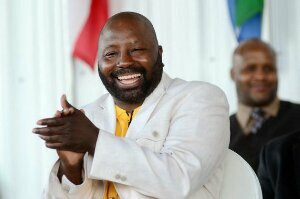 He also worked as a fight commentator, a job he simply loved and can’t wait for the next opportunity. Mark is best known for his historical accomplishment of becoming the first African American Flyweight Champion as well as a two time Super Flyweight Champion. Despite these accomplishments, when Mark first retired he felt that he didn’t get his just due, since he never got the marquee fights due to the politics of the game. However, that all changed in 2011 when Mark got the call from International Boxing Hall of Fame letting him know he was going to be inducted into the hall of fame in his first year of eligibility. It isn’t often that fighters are voted in on their first year of eligibility. Despite not making the millions the marquee fights would have brought, Mark’s career was capped with the boxing writers acknowledging to him and the fight world just how great of a fighter Mark “Too Sharp” Johnson really was.